Create a caricature of one of the two main US presidential candidates - Donald Trump or Hillary Clinton. It's time to vote for the latest pixel art challenge: BEDEAD. Thanks so much to all who took the time to vote and participate in the challenge! Check out the Backlit forum thread for more information. Well, it's that time of the year again. This week, using the color #BEDEAD, depict something death-related. It's time to vote for the latest pixel art challenge: Backlit. Thanks so much to all who took the time to vote and participate in the challenge! Check out the Three Word Title forum thread for more information. There's only a few days until Owlboy -a game from DPad Studios founded by PJ member Snake- is released! In this special competition, we want you to design your own Owlboy poster. While you can use character designs and locations from Owlboy, you have to pixel everything yourself, including the title. Top three entrants will win a copy of the game plus unique tropies for their profiles. The following pixel artists produced Pixel Joint's top rated pixel art for September 2016. Many thanks go out to this month's top pixel artists and all the members who took time to rate. Create a scene that is lit from behind. Canvas Size - 200 x 200. It's time to vote for the latest pixel art challenge: Three Word Title. Thanks so much to all who took the time to vote and participate in the challenge! Check out the Polearms forum thread for more information. Using the Pico-8 restrictions, create a mock-up of a title screen for a new and original game. The title of your made up game must have exactly three words in its title. Hyphenated words and contractions count as one word. 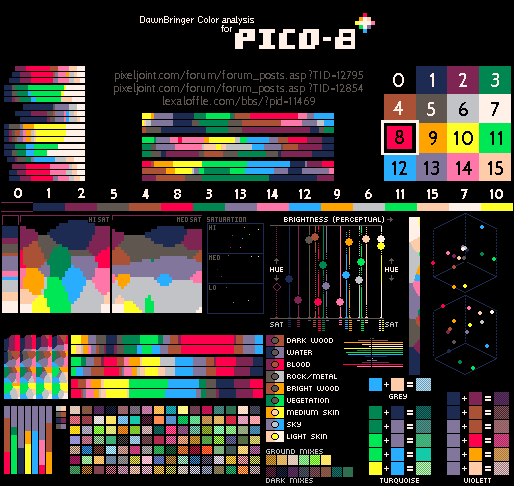 A helpful guide to the Pico-8 palette. A good example of a Pico-8 title screen - by iLKke. Canvas Size - Exactly 128 x 128. It's time to vote for the latest pixel art challenge: Polearms. Thanks so much to all who took the time to vote and participate in the challenge! Check out the Triangulate Pixel forum thread for more information. Create a sprite of a polearm weapon - real or fictional. Canvas Size - Max 25 (width) x 250 (height). It's time to vote for the latest pixel art challenge: Triangulate Pixel. Thanks so much to all who took the time to vote and participate in the challenge! Check out the Tree Monster Sprite forum thread for more information.